Scary! A local story some say is true. When a big animal kidnaps a child, the people must hunt down the animal to get her back. 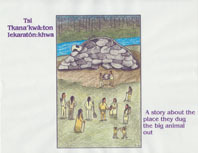 Adapted by Karonhianó:ron Alice McDonald, from a story by Tiéhr Etienne and Aronhià:ke Etienne. Illustrated by Otsi’tsa’ón:we Julie Gaspe.